A frightening diagnosis of mesothelioma brought Sally Kirkvold to Mayo Clinic. To her great relief, the prompt and thorough care she received put the cancer into remission, allowing her to turn her attention back to normal life. When mesothelioma strikes, it is aggressive and often deadly. Caused primarily by exposure to asbestos, the cancer grows in the mesothelium, which is a thin layer of tissue surrounding the body's internal organs. This cancer most often affects the lung lining — a condition called pleural mesothelioma. The condition thickens the lining and causes fluid to develop under the lung. That often leads to labored breathing, coughing and chest pain. Those symptoms plagued Sally Kirkvold for months, but she didn't know the cause. "I was a sick lady for a while," she says. Sally sought treatment repeatedly near her home in Fairbanks, Alaska. She was diagnosed with pneumonia, among other things. When her symptoms didn't improve, she underwent a chest CT scan, which showed a thickening of the lung lining on the right side of her chest. A subsequent biopsy revealed that Sally had malignant pleural mesothelioma. The cancer appeared to be confined to the lining of her right lung. Sally's doctors immediately referred her to Mayo Clinic's Arizona campus. There, in January 2016, the multidisciplinary thoracic oncology team took on the challenge of helping Sally with this rare and potentially life-threatening cancer. The team recommended a three-pronged treatment strategy. With Helen Ross, M.D., in Medical Oncology, the team first recommended chemotherapy. That improved the appearance of the cancer on PET/CT scans. Next, Mayo Clinic surgeon Staci Beamer, M.D., was able to remove the tumor and the right lung lining. Following recovery from surgery, Terence Sio, M.D., in the Department of Radiation Oncology, recommended proton beam therapy for Sally. Today, after a nearly year-long relocation to Arizona, the 77-year-old grandmother has resumed life with her husband in Fairbanks. "Sally, with all of the intense and necessary treatments that have been given to her, has recovered remarkably well," Dr. Sio says. "She remains disease free and side-effect free to this day." Sally didn't smoke, and her living conditions didn't put her at high risk for developing mesothelioma. But mesothelioma can take 20 to 30 years to develop, so people may not realize they were exposed to asbestos years before. Asbestos is also present in the natural environment in some areas, which can present a risk of mesothelioma. In some cases, the cause of mesothelioma is never identified. As part of her treatment plan, Sally was evaluated and proved to be a good candidate for proton beam therapy. This therapy is particularly attractive as a treatment for people with mesothelioma because using proton beams can reduce radiation exposure to the lungs and heart, while allowing effective doses of radiation to cover the chest wall and lung lining. With conventional radiation therapy, the radiation spillover is much broader and deeper than proton beam therapy. The side effects of radiation spill over to the lungs and heart can be dangerous. The precision of proton beam therapy can minimize those risks. The protons are focused exactly on the target, so the radiation goes to that point and then stops. "With proton beam therapy, the chance of spilling radiation into the other lung was virtually zero. The dose to the heart decreases by a lot, too," Dr. Sio says. "As a result, the chance of her developing a life-threatening side effect from the treatment immediately or afterward hopefully decreases to be minimal." Although Sally had the most advanced medical science behind her, she says her first appointment at Mayo Clinic in February of 2016 was nerve-wracking. 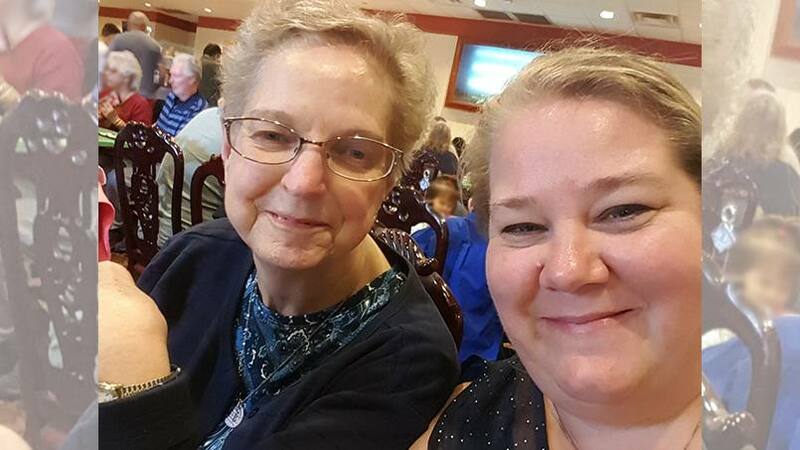 At that time, she didn't know anything about mesothelioma, and she was anxious about what the doctors might tell her, says Sally's granddaughter Jeannette Atkisson, who accompanied her grandmother and grandfather to the appointment. "But I think after that first meeting, she's been a lot more calm and feeling like everything is going to work out," Jeannette says. Part of Sally's peace of mind came from her physicians keeping her informed about her care plan throughout the process. "They were very open with me and explained thoroughly what was going on and what I had to do as far as the treatments," Sally says. The proton beam sessions were 15-minute appointments, Monday through Friday, for five and a half weeks. Sally and her husband had travelled frequently to Phoenix to visit Jeannette and her family. But because they didn't have a local address, they qualified for housing at Hope Lodge. An extended-stay residence for cancer patients undergoing treatments, Hope Lodge, is a component of the Village at Mayo Clinic and operated by the American Cancer Society. "Hope Lodge gave us a chance to be right there, and we had a very good experience," Sally says. "It's just one big family, with everybody helping each other." They even met another couple at Hope Lodge who were from Alaska, living just a few miles from them in Fairbanks. Although Sally says her first dose of her chemotherapy was "a doozy," and she experienced slight burning from where the proton beams entered her skin, she was pleased with her care at Mayo Clinic overall. "My husband and I keep saying that we've seen plenty of doctors and many nurses at Mayo Clinic, and we haven't met anyone that we haven't liked," she says. "They are all really attentive." The way Sally has been received has prompted her to return to Mayo Clinic for her follow-up care, which will consist of quarterly visits for repeat scans to monitor for new cancer growth. "Once we started down here, I just felt more comfortable," she says. "They know what they're doing." Having a reason to travel to the warmth of Arizona and visit her granddaughter makes those trips all the sweeter, she adds. Check out Mayo Clinic's Proton Beam Therapy Program. Explore Mayo Clinic's campus in Arizona.